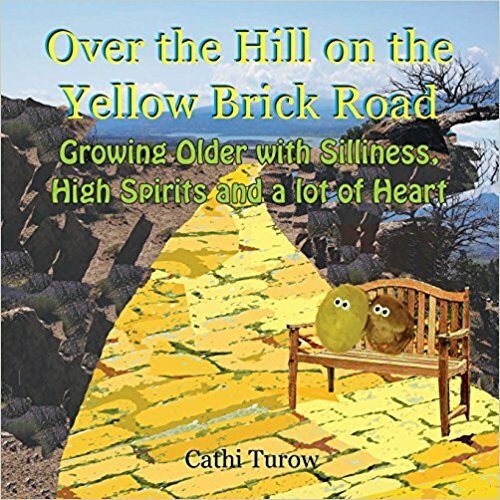 As I climbed Over the Hill on the Yellow Brick Road, suddenly I heard a small voice screaming from below! I looked down and realized I’d almost stepped on a panic stricken caterpillar. I had to apologize! CATERPILLAR: You almost gave me a heart attack! I didn’t see you there! CATERPILLAR: That’s what they all say. CATERPILLAR: As okay as I’m gonna get right now. I’ve got bigger problems. CATERPILLAR: Like, I’ve been putting off going in a cocoon until the last possible minute. I’m claustrophobic. But now the time has come. I feel your pain. I’m claustrophobic, too. Yeah. I don’t do elevators, tunnels, airplanes, MRIs…whenever I can avoid them. CATERPILLAR: Well I can’t avoid going in my cocoon anymore. I’m exhausted all the time. I’m always starving and stuffing my face with leaves. I’m not the caterpillar I used to be. Every part of my body is telling me this part of my life is over. So, before you go in your cocoon, why don’t you take a Xanax? Or have a glass of wine? I have a glass when I take short plane flights. It takes the edge off for a few hours. CATERPILLAR: We’re not talking hours here, we’re talking weeks. Well, at least you only have to go in your cocoon one time. Then it’s over! And you’ll be able to fly! Don’t you want to fly? CATERPILLAR: No. I love crawling. I don’t want to give up my feet. CATERIPLLAR: And I don’t want this part of my life to be over. I know!!!! I have two kids and I loved bringing them up. But they’ve grown up and just left home. I don’t want this part of my life to be over either. Yes. But it seems the universe is pushing us to move on. We have no choice. CATERPILLAR: Yup. I have to fly. I have to fly, too. I mean, my daughter lives far away now. If I’m able to get myself to sit in a plane for five hours, I can visit her a lot. And if I’m able to fly even longer, I can see so many parts of the world. I’d like that. CATERPILLAR: Maybe flying will open new doors for me too. Maybe I’m part of something bigger that I can’t see. So, I guess I’ll take you up on that bottle of wine. …after a few hours she was able to fly in a straight line. And me? Well, since I’m still Over the Hill on the Yellow Brick Road, when I click my heels together I can visit my daughter in a flash. It works for now. But…if you’re a bad flyer too, I’d love to hear from you. What do you do on a plane to avoid jumping out of your skin? I agree, a book helps. On longer flights, I find myself flicking through movies and tv like a crazy person, but it passes the time. Nice to meet you! Oh, I laughed when I saw the caterpillar imbibing…and now I know why butterflies zig-zag the way they do! Haven’t flown in years & have never been able to sleep on planes, so recovering from inter-continental flights has always been tortuous! LOL about knowing why butterflies zig zag! I never sleep on planes either, but if I find a chick flick in the movie choices on a flight, I watch it over and over and over and over again. Gets me through. God I LOVE flying. I read, sleep, watch movies and every so often, someone comes along and gives me a snack! What more could you ask for? Ha ha! I ENVY YOU!!!! I wish I could experience flying that way. I’m too busy worrying about the turbulence and staring at the “my flight” screen to make sure the pilot knows what he’s doing. I never know when I might have to step in and help out. I love your idea about the turbulence feeling like special effects behind the movie you’re watching! I’m definitely going to try thinking that way the next time I fly! Thanks! Poor caterpillar with claustrophobia! But seriously, I’m not comfortable flying either. I try to take something to read to take my mind off the fact that I’m in a narrow metal tube thousands of miles above the earth. Also, an aisle seat is an absolute necessity. You have such a wonderful sense of humour! Love the conversation & the pictures! I feel for you regarding the flying; it really is not my thing, and I dread long flights. I am fortunate that I am able to sleep most of it off, but I can hardly eat anything at all, so it’s not great when I have to forgo many meals while on the plane. I agree! It would be a tragedy to be grounded and not to be able to travel! Great caterpillar conversation! I missed seeing the Like button and the comment section when I first looked at your blog because there is a very long white space under the post and I thought that was the end of it. Don’t know why that much space is there. Anyway, I enjoyed your post. Thanks so much for going back to my blog and checking out the issue. I’m going to work with a graphic designer to help me close the white space and other things. In the meantime, I’m so glad you enjoyed my post. I’m following your blog and look forward to reading more of your work. That’s great to hear. Thank you for following my blog. Best to you on yours.